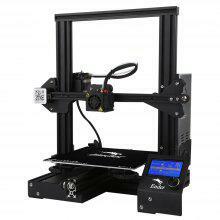 According to Tenvis, the JPT3815W was their best seller in 2012 despite of the emergence of IR-cut and HD models. So they decided to give the 2013 edition a little refresh. This device keeps the shape that became so popular since my first IP Cameras purchased back in 2009, with the lens ball recalling the Princess Leia's hair cut. 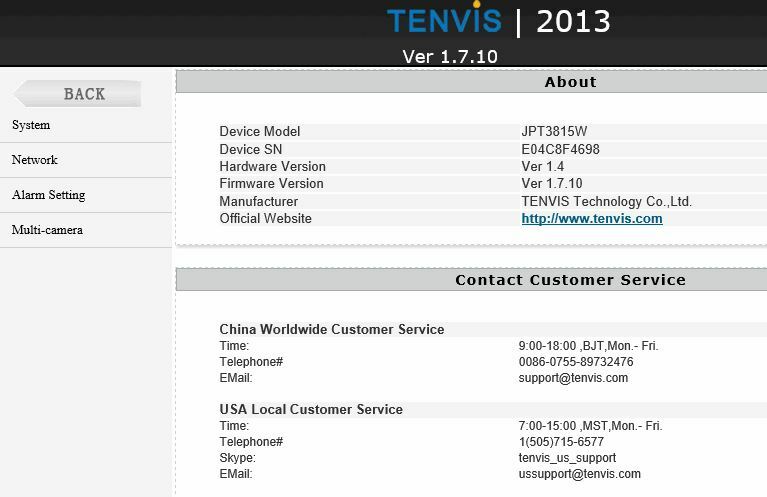 My Tenvis unit came with the firmware 1.7.10. That version was unstable and I upgraded to the newly released 1.7.15 during my tests, which gave some relief. Tenvis warned that the 2013 edition's firmware, which now comes as a unique 3.6MB .bin file, is not backward compatible. The IP Camera Wizard software is aimed at making the network setup as easy as possible. 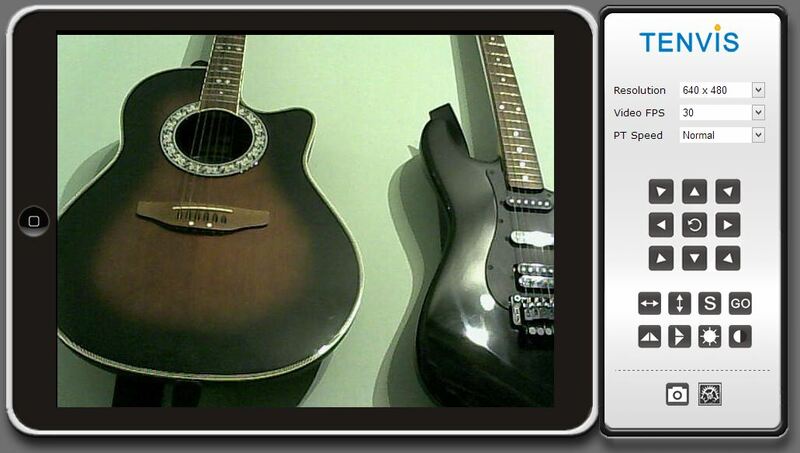 The program will detect the camera for you and help configuring it in a few steps. The following third party DDNS are also possible: dyndns.org, freedns.afraid.org, www.zoneedit.com, www.no-ip.com, and ddns.oray.com. 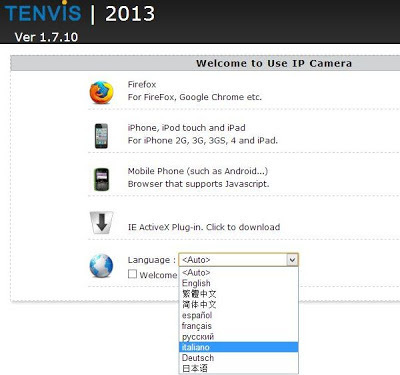 All these efforts in assisting the beginner with setting up the IP Camera are good points to be credited to Tenvis. If you're more experimented, checking the predefined IP address and port labelled on the camera base should get you started quickly as well . 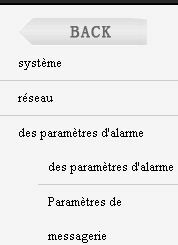 The menu layout remains clear, with another particularity of Tenvis: they show their Customer Service contact details on the system information page. Rare enough to be noted! During my tests, with the interface set to English, I sometimes got Chinese text appearing. Most of the time it self-refreshes to the English version. Sometimes also the page would need a refresh to show the picture. However, these problems were seen under Windows 8, IE 10, Chrome, Firefox, and I didn't appear for the shortest time I used an XP workstation. Leaving the iPad-style consideration aside, the general look and feel of the refreshed JPT3815W interface is clean and intuitive. The Mozilla interface has no option for 2-way sound, no movie recording, and no multi-view, and perhaps adding a VLC view to the Welcome Screen (the iPad button on the left brings you back to it) would be a nice addition in the future. 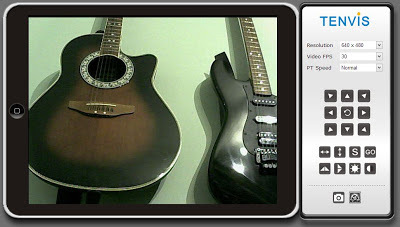 In addition to the various viewing ways already provided by the Welcome Page, the video stream of the JPT3815W-2013 can still be used as before with the SmartPhone app Hit-Mob's IP Camera Viewer. Strangely, in Synology Surveillance Station, while I could preview the camera as a Foscam FI8908W, it was impossible to enable it afterwards. I had to use the good old generic url .../videostream.cgi. While I was playing with the CGI command set, I noticed that some of them would not work. This includes the get_misc.cgi and set_misc.cgi. This later is generally very convenient to activate options that are not (yet) in available the user interface. As an example set_misc.cgi?led_mode=2 would normally turns off the front LED, but not anymore! Furthermore, the missing video mode option in the GUI could normally be changed by issuing /camera_control.cgi?mode=2, but while I receive the "ok" from the camera, nothing changes. This partial support of the SDK is definitely something I'll run through the Tenvis support. To be distinguished from the crowd, the JPT3815W from Tenvis has provided a well thought Setup Wizard, a modern user interface and its own free DDNS service. The reworked interface is missing some basic features (e.g. LED control, video mode), and an updated SDK documentation is badly needed. - Clear printed Startup Guide in proper English. I am kind of new to this camera world. I want a system to use for my home security. Do you suggest 2013 edition is a better option that the older one? What will be a good camera for home security (with a budget around <=$100)? Thanks in advance for your help. Your posts are really helpful. This one is not yet as finished as the old version but they're likely to stop supporting the previous release soon. There's already a newer hardware revision of the 2013 model (1.4 -> 1.7). 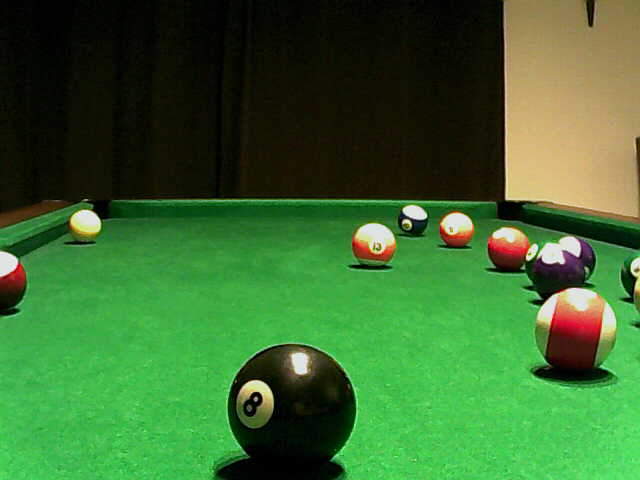 For your budget you could afford a H.264 type of camera with better compression and picture quality. do you know if it is possible to use Foscam's old-format firmware (ie. 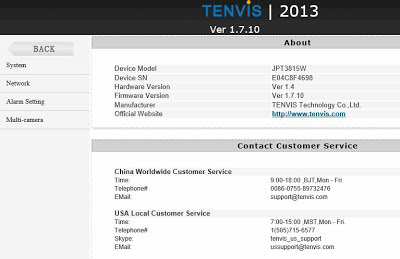 separate firmware and web interface files) to the 2013 edition of tenvis? I doubt it'll work, the 2013 firmware uses a unique update file including both WebUI and application, Foscam uses 2 files. Also, the board is different and memory size will differ. you mean even different from the previous version of tenvis? I mean, i really don't get it. with my common sense, these cameras are ALL chinese clones, possibly made in the same factory. I don't really understand how they can be different inside. Previous non-2013 editions definitely use a different firmware format. Tenvis is trying to do their own R&D for the newer IP Cameras. 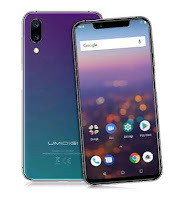 There are indeed hundreds of very similar cameras but some have cheaper components inside and different onboard memory capacities. These IPC's are very easy to brick instantly. Repairing requires serial access to the mainboard (jtag port) in order to inject hardware-specific files to the right memory addr. Not always an enjoyable experience. I can access my webcam using firefox, but Tenvis setup wizard does not detect any camera in my network, how is it possible? I can't access my camera using my public IP: how can I know if my Digicom RAE300-A01 router equipped with firmware 253.145.2-006 does support loopback or not? I can't access the webcam using dyndns.org free service: I redirected internal 81 port to public 81 port on my router, I wrote my dyndns login data into the tenvis cam, but when I connect to xxxx.dyndns.org:81 , connection timeouts. 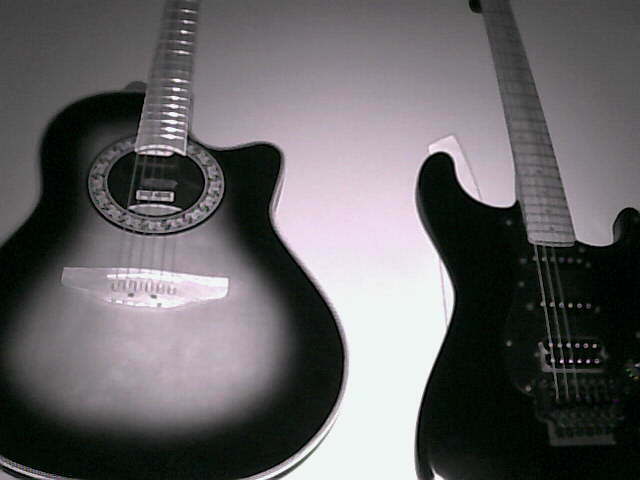 Hi, got it with the cam viewer pro. Bloody stupid when live picture there is audio received, when go to record mode audio disappears and records only video bloody anoying!!! Anyway to fix it. Thank you very much. Than you for review!!! There was a trouble with jpt3815w tenvis - faded picture and turn upside-down. I disassembled the camera - and there are many broken wires, and it does not matter - would be restored, if they were not of the same color - red, black ... Can anyone have this camera? I would be very grateful PHOTO wiring harness - what goes where. The scheme does not really find it, only if you find the same camera. I will be grateful.